The now-devoured Cake Six is hands down the most well-known. But the most creative Auburn groom’s cake ever actually wasn’t a cake at all. “My husband (Zack) was in the band, I was a Diamond Doll, one uncle played football at Auburn, one played baseball, and we all went to Auburn,” says Bragan Feldman, a 2004 Auburn grad living in Birmingham. “So it was a given we would incorporate Auburn in our wedding”—groom’s cake included. But there was a problem: The groom didn’t like cake. Feldman says she was shopping at Auburn Art during the 2009 football season when she came up with the solution. 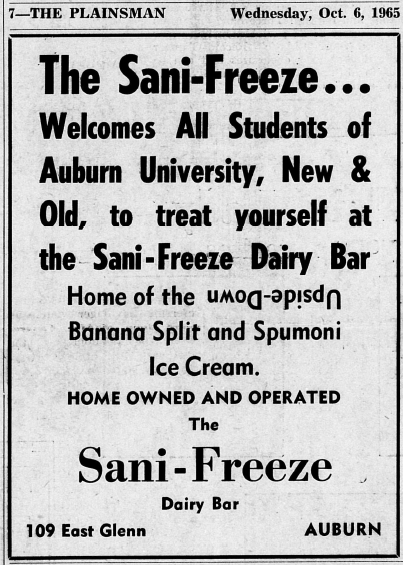 A trip to a Birmingham food equipment rental place (and the grocery store) later, and Feldman literally had the ingredients for a gone but not forgotten Auburn institution in miniature. 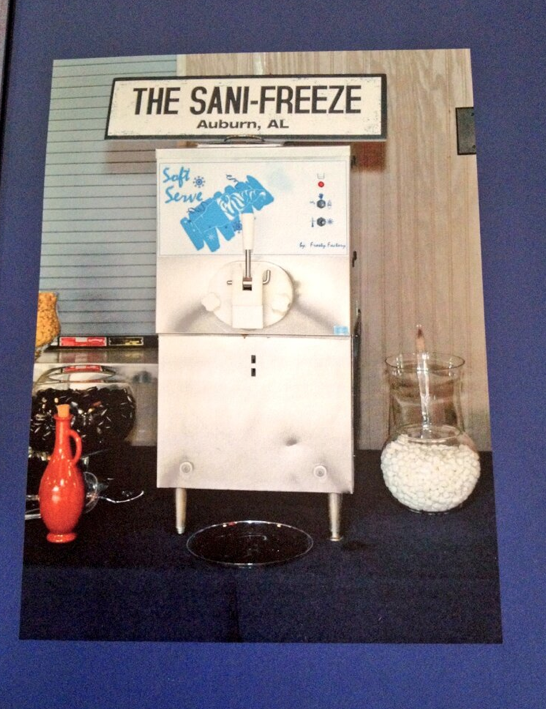 Both Zack and Bragan’s first year at Auburn, 1999-2000, was the last for the storied Sani-Freeze, aka the Sani-Flush. In 1994, the business relocated from its iconic shack at 109 E. Glenn (here it is in 1993, covered in snow) to a Dean Road location. Its final ice cream cone was served inside The Goal Post. The Feldman nuptials in 2010 brought those who stuck around for the reception back to the Flush’s glory days. It’s now a fixture at the Feldman’s house. Related: Auburn ball boy Andrew Jarrett’s groom’s cake has him running down Jordan-Hare’s field of frosting.